About Us | Intelligent Quilting, Inc. I made my first stuffed animal when I was about 5 years old, and have experimented with just about every sewing technique since; garment construction and tailoring, heirloom sewing, original machine embroidery, quilt piecing and free-motion quilting with my home machine, creating mohair teddy bears and now. . . 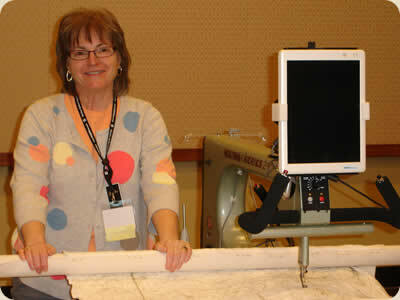 I work as a professional machine quilter with three APQS Millennium longarm machines each equipped with an IntelliQuilter computerized quilting system. With the addition of the Intelliquilter I have unlimited creative options and a thriving longarm quilting business. Creating digital designs for computerized quilting systems was a natural result of getting my first IntelliQuilter. I always fashioned my own designs when I was a hand-guided free-motion quilter, so creating digital designs was a natural progression. I was one of the first designers to join Intelligent Quilting in 2007 and was delighted to have the opportunity to acquire it 5 years later, in late 2012. A few months later my son joined me and it has been exciting to experience the vibrancies of growing Intelligent Quilting together. Over the years, I have been pleased to receive recognition for my sewing efforts: I had bears nominated for the 1998 and 1999 Golden Teddy Awards, original machine embroidery awards from Husqvarna Viking, numerous awards for machine quilting, and a couple of nominations for Machine Quilting Teacher of the Year. Additionally, I've been published in both Quilter's Newsletter Magazine and Machine Quilting Unlimited. Hi! I’m Brandon and I’m a web developer and very amateur graphic design artist. I started working for Intelligent Quilting in the beginning of 2013 as Webmaster, but since that time I have started to digitize some of my own designs and doodles. As a designer, I am inspired by science and the world around us, so many of my designs are geometric or mathematical in nature. I also enjoy cultural art very much and get inspiration from that as well. In the latter half of 2013 I started to rebuild our site, so that we could expand our pattern selection easier and have more features to offer. As scheduled, on January 1st we rolled out with the new site and the response was more than overwhelming, and I have had tons of fun this year growing and expanding it. I don’t discriminate between weekends and weekdays so drop me a line anytime, I am always open to suggestions or ideas for improvements. Intelligent Quilting was established in 2007 to meet the needs of the growing computerized quilting industry. Our goal is to provide you with first-class customer service and one-stop shopping and information source for digital designs. At Intelligent Quilting, you'll find thousands of digital designs. We have an extensive collection from a diverse and talented group of artists - inspired by imagination, nature, fantasy, tradition and more. All of our patterns are digital and are available for immediate download.